That’s the kind of thing that makes you think about ice cold ice cream and tasty waffle cones. You know, the fun of trying to eat it fast enough that it doesn’t melt, creating a sticky mess on your hands, but not too fast as to create a headache. It’s a tough world out there. These are the real problems. One delicious solution is the ice cream sandwich. 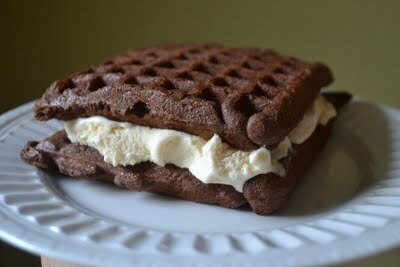 Have you ever considered making your own waffle to go with the frozen treat? That’s what we’re doing this week. Thanks to a craft from ComeTogetherKids.com, we’re making cake and ice cream sandwiches. It’s a simple concept: Take chocolate cake mix – from the box or the scratch recipe below – and use it to make waffles in a waffle maker. Let the waffles cool the spoon vanilla ice cream on one side. Add a second waffle and enjoy. It’s that simple. Take everything out of the refrigerator so that all ingredients can be room temperature. Put all the cake ingredients: flour, sugar, baking powder and soda, cocoa, butter, eggs, vanilla and sour cream into a food processor and process until you have a smooth, thick batter. If you want to go the long way around, just mix the flour, sugar and leavening agents in a large bowl and beat in the soft butter until you have a combined and creamy mixture. Now whisk together the cocoa, sour cream, vanilla, and eggs and beat this into your bowl of mixture. Once you have the mixture, use it the way you would a waffle batter. Pour it into the waffle maker and follow the cooking instructions for your personal machine. Allow the chocolate waffles to cool. Once cold, take a couple spoonfuls of ice cream – your choice in terms of flavor – and spread it on one waffle. Once you have enough, place another chocolate waffle on top. Then, enjoy!